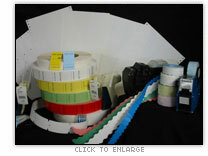 Hand Held Price Labelers: We always have labels & ink rollers for all price labelers in stock. We carry normal and tamperproof labels in 3 different adhesive types (all colors are available). Tag Attachers: We carry both pistol-grip & tabletop pneumatic attachers plus needles and attachment barbs (many styles/sizes/colors available). Roll Tickets: "Thrift Store - All Sales Final" Roll tickets are available in glossy or matte finishes, both of which come in many colors. Pressure sensitive roll tickets are also available in many colors & sizes. Hang Tags: We have hang tags available for dot matrix, laser, and ink jet printers. Perfect for all in store desktop publishing.